Once upon a time, many centuries ago (about 1700 years ago), it was a time of war and trouble. There lived a king and his princes in Central Siam. The elder prince named Jatukam and the other named Ramathep. After many years of war, the King finally conquered and managed to secure Sri Lanka into part of his Kingdom. There was a saying that the King possessed a sacred treasure, this was none other than the holy relics of Lord Buddha. Before the King began his journey to the newly conquered land, he tasked the protection of the relics to his two princes, & ordered them to guard it with their lives. Some time later, the princes received information of plan by their enemies to capture the relics. They immediately informed the King in Sri Lanka. The King instruction was to quickly take the relics away by sea and head to Sri Lanka. Halfway through the journey, a thunderstorm struck and their ships were sunken. Except the two princes, the rest of the crew did not survive. Later the two princes built a temple on this holy land and with much hard work, they also establish a wealthy and strong city. They brought new hope and peace to all the people. In remembrance of the great deeds by the two princes, they named this place Nakhon Si Thammarat in their honour. This is now located in Southern Thailand at the present time. The temple that the two princes built for the relics is called Wat Mahathat - as it is known now. Ever since then, after a few centuries, many people had travelled to Wat Mahathat to locate the relics that were buried by the princes. Finally, they found a stone carving and the relics buried at the Wat. The stories of the two princes were found engraved on this stone. 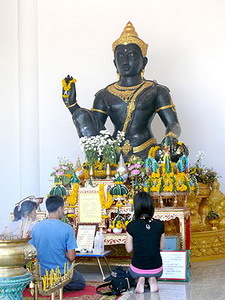 The temple is located on Ratchadamnoen Road in Tambon Nai Muang, Amphue Meuang of Nakhon Si Thammarat province. This is one of the most important historical sites in Southern Thailand. The stupa, 55.78m high, has a distinctive Sri Lankan style. The top of the spire is entirely covered in pure gold. Inside the temple are many buildings of importance, especially the royal building which has beautiful architecture from the Ayutthaya period and the Sam Chom building, where the Buddha image garbed in royal attire - Phra Si Thamma Sokarat is housed. There are also the Phra Maha Phinetkrom (the equestrian image) building and the Thap Kaset building; while the Khian and Pho Lanka buildings are used to display artifacts donated to the temple by Buddhists from the whole region. Over the doorway at the entrance of Wat Phra Mahathat in Nakhon Si Thammarat, there are the statutes of Tao Kadtukam and Tao Ramathep, the guardian deities of holy relics of the Buddha. 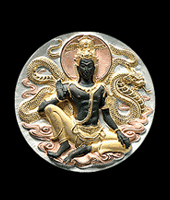 The name of one deity is Tao Kadtukam, which later people understand that he is none other than Jatukam. There are many stories on how the City Pillar (Lak Meuang) and the first Jatukam amulets were made. One story tells of Police Maj Gen Sanpetch Thammikun, the provincial police chief during the 1980s, going to Wat Nang Phraya during a shamanistic ritual. The medium, a woman, told the policeman to come back. When he did come back later the woman wasn't there, but had been replaced by a new medium claiming to be the spirit of the military leader for the B.E. 17th century Nakhon Si Thammarat king. The police general came a third time, and the second medium claimed to be yet another spirit - Jatukam, who instructed him to lead the construction of a city pillar. However, the spirit advised him that first he should consult with Police Maj Gen Khun Pantarakrachadej (also known as Ajarn Khun Phan), who was thought to be a master of Buddhist magical arts (Puttakom). This is believed by some to be the reason why Jatukam Ramathep was chosen to be a model for the amulet images when the campaign to raise funds for the city pillar was launched. The city pillar was partly completed in 1986, and the original Jatukam amulets were made in 1987. 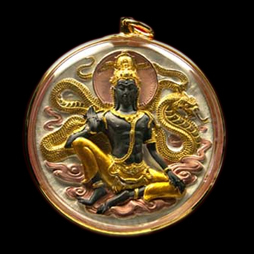 It was circular pendant a five-centimetres in diameter, and was priced at 49 baht. Now many are sold for more than 100,000 baht each. In the past only very few Jatukam amulets were produced, but after Police Maj Gen Khun Pantarakrachadej (Khun Phan) passed away recently at the age of 103 (some say 108), the amulets again became very popular. It may be significant that his death on Sep 5th 2006 was just two weeks before the military coup in Bangkok. Since the royal cremation ceremony of Khun Phan last February, Jatukam amulets have become even more popular.